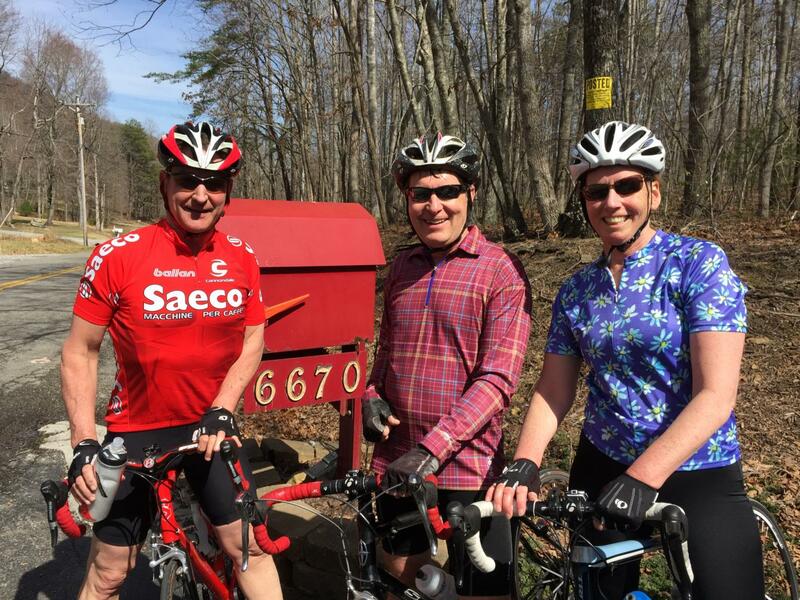 Gary Butcher, John and Mary Carlin at the famous Red Mailbox on Bradshaw Road. It’s a great early season climb. Long, but not very steep. 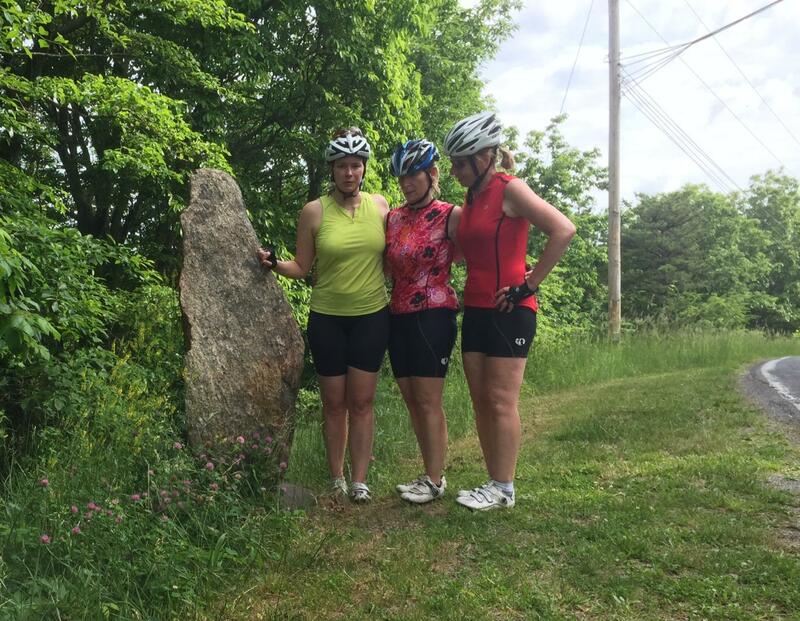 The Blue Ridge Bicycle Club is onto something. This spring the club launched the Spring Summits Challenge. This completer vs. “competer” take on cycling achievement is perfect for my riding group made up of mostly 50-somethings. In case you hadn’t heard about the Challenge, it was pretty straightforward. Climb the ten designated peaks during the three months of spring. Verify each by snapping a selfie at the top, and submit it to the club. For this you receive a T-shirt and a wonderful sense of accomplishment. There was an additional award to the man and woman who did it in the least number of days. The challenge offered a chance to change the way I looked at riding. Back in the day I rode every solo ride like it was a time trial. Any group ride was at least competitive if not a race. Winning wasn’t important, but whether it was against the course or other riders, competing was. While there is still a tinge of that spirit, it’s refreshing to achieve a worthwhile goal at a more leisurely pace and to make the ride more about the camaraderie than the bike. Members of our group gathered on (typically) Sunday mornings and knocked out different peaks, one or two at a time. Afterward we retired to a well-deserved breakfast at a local restaurant. The ride and meal together made the entire experience much more social and enjoyable. On most of these rides I didn’t even think to check my average speed. This is a breakthrough. Perhaps the best day was the Potts Mountain climb, when Mary and I joined Barbara and Gary Butcher at the Swinging Bridge Restaurant in Paint Bank. When we arrived there was another group who had the same idea. After an easy 10-mile warm up, we did the climb – which, while on the difficult side – was not as hard as it looked from the car on the way to the restaurant. We took our photos at the top and bombed the downhill back to the restaurant. The Swinging Bridge Restaurant actually has a swinging walking bridge in the rafters and the business itself is an odd combination of cool country kitsch and amazing food. John and Mary at the top of Cahas Mountain. Mary holds up 10 fingers signifying it was the 10th and final Peak. The climbs included everything from the short, but steep Peakwood in South Roanoke, to 12 O’clock Knob to Mills Gap and Bent Mountain. Click here for the complete list. People ask me what was the hardest and I honestly have to say it was 12 O’clock knob. That ride is unrelenting and a bit steeper than the gearing on my bike (at the time) could handle. OK – than my legs could handle. Whatever. I’m better suited to short and steep or long and gradual. Long and steep is hard for me. 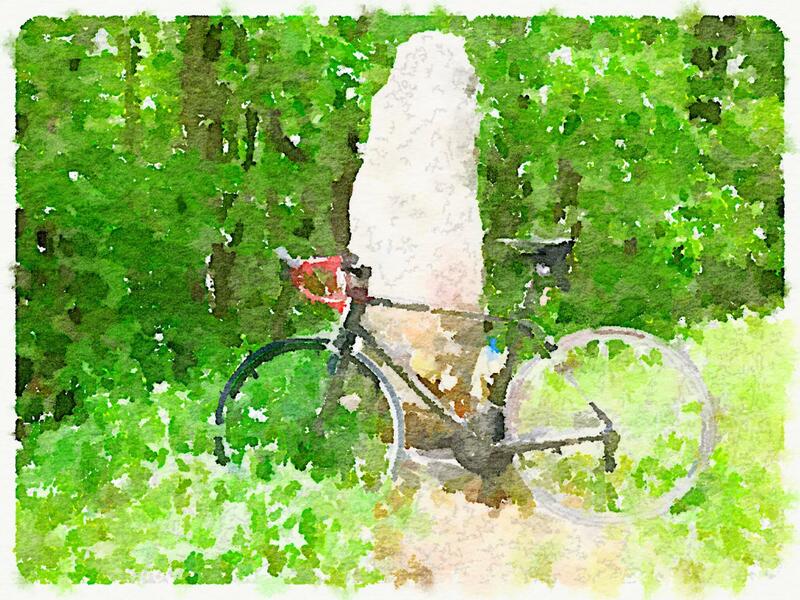 The Spring Summits website has profiles on all the climbs as well as lists of those who completed the rides and the number of days it took to do so. 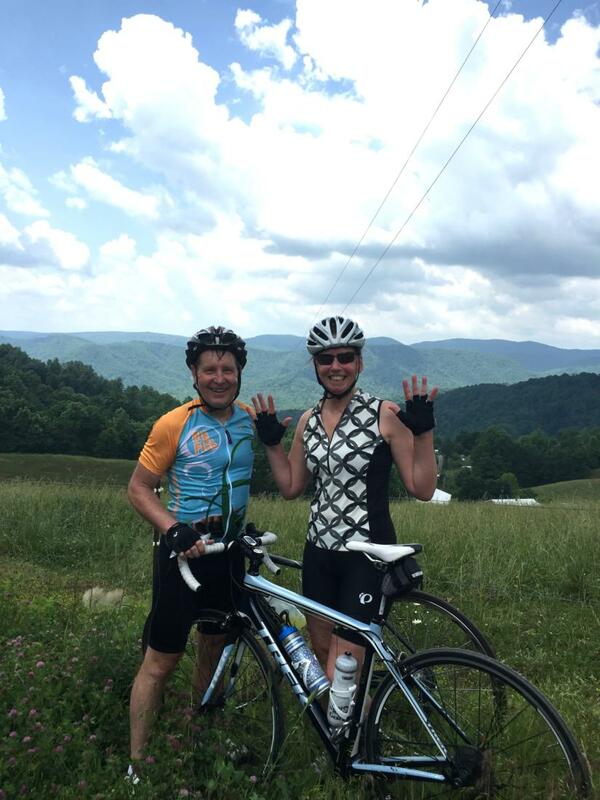 BRBC President David Sistler and John after climbing Peakwood for a story on WSLS. 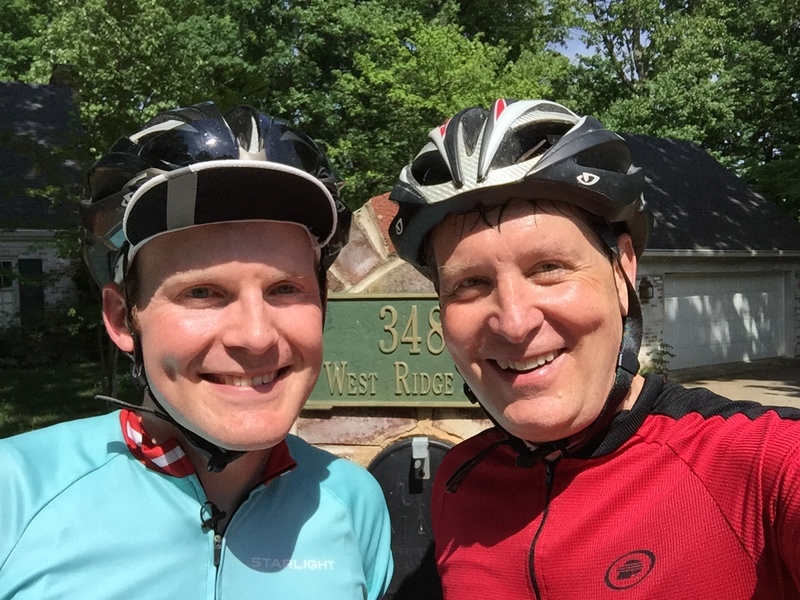 I sent some questions to club president David Sistler, whom I interviewed and rode with for a story on WSLS. He says a survey of participants shows that the series was very popular and that it will be back next year. “We’ll be changing it up some to keep it interesting, but the general idea will remain. I’d like to add or rotate in some different mountains so the competition remains fresh,” he told me via e-mail. “Regarding the survey, people really like the completion challenges and group rides (weekend or Tuesday Night Beer Rides ) … We do, however, get a lot of interest in the Star Challenge and I suspect the Cyclocross Series in September will be well-attended. Regarding more completion challenges, I’m not sure what will be next. Like I said, we plan on doing Spring Summits again next year and maybe we’ll come up with another one for next fall. The board has its strategic planning meeting in August where we’ll discuss these sorts of things,” said Sistler. I’m anxious to see what the club comes up with next.